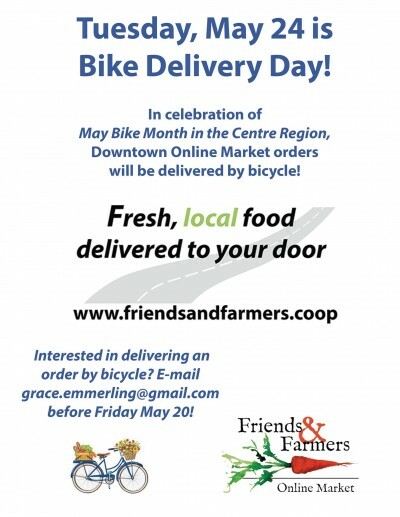 If you’d like to take a photo of our bicycle deliveries, please also report to the Meetinghouse on Atherton at 3:30 on Tuesday, May 24. Friends & Farmers Cooperative is a community-owned, democratically-controlled business working to open a grocery store that will give priority to our local farmers and producers. As a stepping stone toward that goal, the co-op launched an Online Market that delivers fresh, local food to 12 zip codes in Centre County. (Customers can also pick up their orders every Tuesday at two locations, The Meetinghouse on South Atherton and State College Friends School.) Unlike a CSA, customers of the Online Market choose what they want, and as much as they want, from 30 local vendors. The Online Market offers tangible progress toward the Friends & Farmers mission: to support and grow the local food economy while offering customers delicious, locally grown and produced food. For more information about the co-op, visit www.friendsandfarmers.coop.